'Fallen but Redeemed' by Dr. De Que - DPC Prints! This is my challenge entry for "Broken." Some time ago, I broke the kit lens that came with my Nikon D70. This subject suggested itself to me as I was thinking about the challenge theme. Originally I was going to compose a still life with the parts, but I didn’t find a pleasing arrangement. And I was struggling with the various notions of broken: 1) Some thing that was broken; 2) A broken spirit; 3) A broken heart; or maybe 4) Broken soul. The last three spoke to me more than simply some thing that was broken. But I also wanted to get in the notion of hope. And frankly I wanted to shock people a little bit. Thinking about shock value, I thought about how clean we try to keep our lenses and that dirt would increase the shock value. Not just dust, but really dirty dirt. 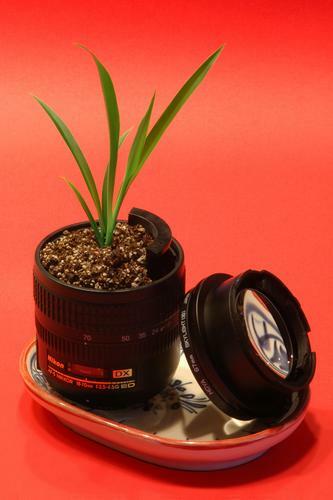 I was looking at the lens sitting on my desk and thought it looked a little like a small pot you’d put a small plant in. What if I filled it with dirt and put a small plant in it?!? So I got a little potting soil from my wife’s supply, and cut off a little baby spider plant from quite a prolific mother plant (with my wife’s gracious permission, I might add). And I potted it in the broken lens. I think I’m on to something! I wanted a plain background that would not distract from the subject. Backgrounds are something I am struggling with. And I wanted a color that would add to the shock value. I used a piece of reddish orange construction paper, set it on the counter and curved it up against the wall to get a sort-of gradient effect. So at this point, I had the beginnings of what I finally produced. I shot 26 different angles, apertures, and exposures and set to work editing. What you see is the final result using some pretty minimal editing. Now for a title; I promised myself several months ago I would never, ever, never use the words of the challenge theme in my title and recently renewed my vow. About this time, the color of the background made me think of broken spirits in the sense of the damned. That led me to think of hell and the fires of hell. So instead of the word “broken” I used “fallen.” Ironically, this was literally true because the lens broke in a fall. The little plant still gives me hope. So while fallen, it was also redeemed by hope; hence the title – Fallen but Redeemed. This photograph originally appeared in the Broken Challenge.